An electronics industry customer in Texas came to Begoun, Inc. with a large precision screw machine order: terminal plugs to be used in an electrical sensor application. The parts were manufactured from alloy 360 brass. The precision machined pins featured an outside diameter of .6025", with gold over nickel plating, and met specified tolerances of ±.002". A 90-degree bend was applied to the part while on the machine, avoiding a costly secondary operation. Begoun produced the entire run of 400,000 parts within 4 weeks, and warehoused the parts for their customers' releases. To learn more about this project, or about what Begoun can produce for you, please see the table below or call today. 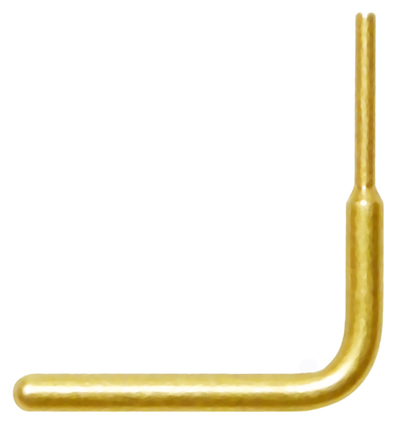 Product Description Terminal pin used in an electrical sensor. Overall Part Dimensions O.D. : Ø.6025"